Huntington Beach FD found themselves in an unusual rescue situation of the equine kind this week. On January 18, the team received a call about a horse that had found themselves stuck inside of a dumpster. Yes, you read that right. A commercial size garbage dumpster. 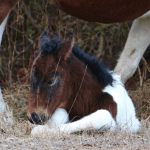 The unlucky horse, Rodeo, climbed up onto a platform next to the dumpster at the Goldenwest Stables near the Huntington Central Park Equestrian Center and fell in. When Rodeo stepped onto the flat top of the dumpster assuming it was a normal surface, he quickly found himself in quite a pickle. 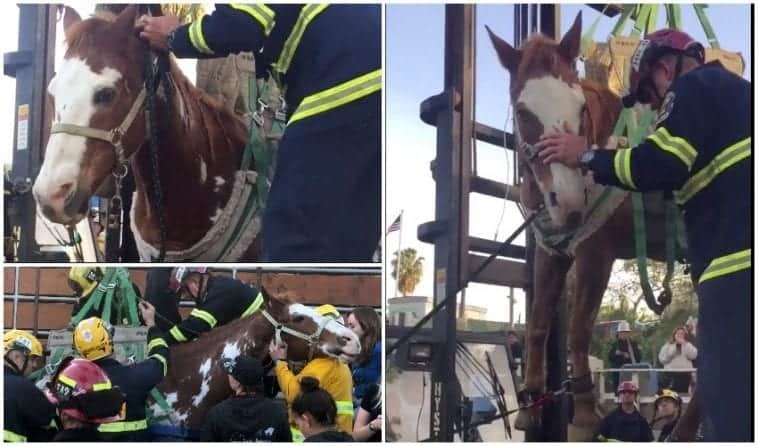 People worked to keep the horse calm, and you can see that the firefighters did their part in helping Rodeo to know that he would be just fine. It was reported by the Huntington Beach FD that neither Rodeo nor any of the firefighters or volunteers were injured during the rescue. Rescuing an animal that’s as heavy as a horse is not an easy feat, and the OCFA Heavy Rescue Team was brought in to assure that everything went smoothly for both the animal and the humans involved. Thinking quickly, the OCFA Heavy Rescue Team used a harness and a forklift to get Rodeo back on his feet and back over where he belonged. 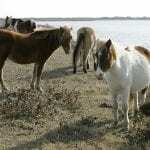 During the rescue, a large-animal veterinarian tranquilized the horse to help the rescue go more smoothly. A special thank you to the brave men and women of the Huntington Beach FD who risk their own personal safety to deliver others–including horses–to theirs. You’re all heroes!